Industry clusters provide not only economic benefits, but also promote technological innovation through networking within a cluster. In this study, we analyze the mechanism of explicit and tacit knowledge diffusion in a cluster and how the network structure and the strength of ties influence the process of explicit and tacit knowledge diffusion. By focusing on four representative real-world networks – scale-free, small world, regular, and random – and the strength of ties between firms, the knowledge diffusion performance of entire organizations in a cluster is examined by the simulation method. We find that the network structure of clusters and the strength of ties are important for the knowledge diffusion performance in clusters. 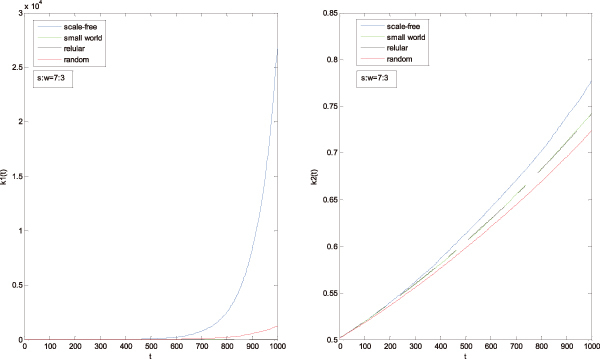 Among the four networks, the scale-free network shows the best knowledge diffusion performance, irrespective of the proportion of strong and weak ties present. In addition, the network with a greater number of strong ties leads to the explicit and tacit knowledge diffusion performance. B. Zhu and W. Wang, “The Diffusion of Explicit and Tacit Knowledge in Complex Networks,” J. Adv. Comput. Intell. Intell. Inform., Vol.22, No.6, pp. 823-830, 2018. A. Saxenian, “Regional Advantage: Culture and competition in silicon valley and route 128,” Harvard University Press, Cambridge, MA, 1994. A. Marshall, “Pinciples of Economics,” London, Macmillan, 1920. M. S. Dahl and C. R. Østergaard, “Knowledge flows through informal contacts in industrial clusters: myth or reality?,” Research Policy, Vol.33, No.10, pp. 1673-1686, 2003. G. G. Bell and A. Zaheer, “Geography, Networks, and Knowledge Flow,” Organization Science, Vol.18, No.6, pp. 955-972, 2007. M. E. Porter, “Clusters and the new economics of competition,” Harvard Business Review, Vol.76, No.6, pp. 77-90, 1998. M. E. Porter and S. Stern, “Innovation: Location Matters,” Mit Sloan Management Review, Vol.42, No.4, pp. 28-36, 2001. J. Koo, “Technology Spillovers, Agglomeration, and Regional Economic Development,” J. of Planning Literature, Vol.20, No.2, pp. 99-115, 2005. P. Krugman, “Increasing Returns and Economic Geography,” Nber Working Papers, Vol.99, No.3, pp. 483-499, 1990. R. Martin and S. P. Paul, “Krugman’s Geographical Economics and Its Implications for Regional Development Theory: A Critical Assessment,” Economic Geography, Vol.72, No.3, pp. 259-292, 1996. A. K. Gupta and V. Govindarajan, “Managing global expansion: A conceptual framework,” Business Horizons, Vol.43, No.2, pp. 45-54, 2000. G. Szulanski, “Exploring internal stickiness: Impediments to the transfer of best practice within the firm,” Strategic Management J., Vol.17, No.S2, pp. 27-43, 1996. P. J. Lane, J. E. Salk, and M. A. Lyles, “Absorptive capacity, learning, and performance in international joint ventures,” Strategic Management J., Vol.22, No.12, pp. 1139-1161, 2001. M. A. Lyles and J. E. Salk, “Knowledge acquisition from foreign parents in international joint ventures: an empirical examination in the Hungarian context,” J. of Int. Business Studies, Vol.27, No.1, pp. 877-903, 2007. J. Birkinshaw and J. Ridderstråle, “Knowledge as a Contingency Variable: Do the Characteristics of Knowledge Predict Organization Structure?,” Organization Science, 2002, Vol.13, No.3, pp. 274-289, 2002. D. B. Minbaeva and S. Michailova, “Knowledge transfer and expatriation in multinational corporations: The role of disseminative capacity,” Employee Relations, Vol.26, No.6, pp. 663-679, 2004. B. I. Park, “Knowledge transfer capacity of multinational enterprises and technology acquisition in international joint ventures,” Int. Business Review, Vol.20, No.1, pp. 75-87, 2011. F. Evangelista and N. H. Le, “Organizational context and knowledge acquisition in IJVs: An empirical study,” J. of World Business, Vol.44, No.1, pp. 63-73, 2009. K. Page, J. A. Hahn, J. Evans, et al., “Learning and protection of proprietary assets in strategic alliances: building relational capital,” Strategic Management J., Vol.21, No.3, pp. 217-237, 2000. C. Park, I. Vertinsky, and C. Lee, “Korean international joint ventures: how the exchange climate affects tacit knowledge transfer from foreign parents,” Int. Marketing Review, Vol.29, No.2, pp. 151-174, 2012. R. Capello and A. Faggian, “Collective Learning and Relational Capital in Local Innovation Processes,” Regional Studies, Vol.39, No.1, pp. 75-87, 2005. R. Cowan, N. Jonard, and J. B. Zimmermann, “Evolving networks of inventors,” J. of Evolutionary Economics, Vol.16, No.1, pp. 155-174, 2006. J. Mu, G. Peng, and E. Love, “Interfirm networks, social capital, and knowledge flow,” J. of Knowledge Management, Vol.12, No.4, pp. 86-100, 2008. J. Choi, A. Sang-Hyun, and M. S. Cha, “The effects of network characteristics on performance of innovation clusters,” Expert Systems with Applications, Vol.40, No.11, pp. 4511-4518, 2013. W. Tsai and S. Ghoshal, “Social capital and value creation: The role of intrafirm networks,” Academy of Management J., Vol.41, No.4, pp. 464-476, 1998. W. Tsai, “Knowledge transfer in intraorganizational networks: Effects of network position and absorptive capacity on business unit innovation and performance,” Academy of Management J., Vol.44, No.1, pp. 996-1004, 2001. C. Casanueva, I. Castro, and J. L. Galán, “Informational networks and innovation in mature industrial clusters,” J. of Business Research, Vol.66, No.1, pp. 603-613, 2013. R. Cowan and N. Jonard, “The dynamic of collective invention,” J. of Economic Behavior & Organization, Vol.52, No.4, pp. 513-532, 2003. C. Park, I. Vertinsky, and M. Becerra, “Transfers of tacit vs. explicit knowledge and performance in international joint ventures: The role of age,” Int. Business Review, Vol.24, No.1, pp. 89-101, 2014. B. Kogut and U. Zander, “Knowledge of the Firm, Combinative Capabilities, and the Replication of Technology,” Social Science Electronic Publishing, Vol.37, No.7, pp. 17-35, 1992. B. L. Simonin, “Ambiguity and the process of knowledge transfer in strategic alliances,” Strategic Management J., Vol.20, No.7, pp. 595-623, 1999. M. Polanyi,“Tacit Knowing: Its Bearing on Some Problems of Philosophy,” Review of Modern Physics, Vol.34, No.4, pp. 601-615, 1962. C. Dhanaraj, M. A. Lyles, H. K. Steensma, et al., “Managing tacit and explicit knowledge transfer in IJVs: the role of relational embeddedness and the impact on performance,” J. of Int. Business Studies, Vol.35, No.1, pp. 428-442, 2004. N. A. Christakis and J. H. Fowler, “Connected: the surprising power of our social networks and how they shape our lives – how your friends’ friends’ friends affect everything you feel, think, and do,” Little, Brown, 2011. R. Cowan, N. Jonard, and M. Özman, “Knowledge dynamics in a network industry,” Technological Forecasting & Social Change, Vol.71, No.1, pp. 469-484, 2004.